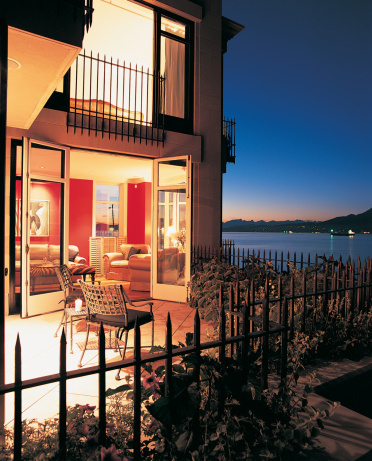 Andersen French doors are patio doors that include adjustable hinges for the most dependable operation and performance. With the bottom door hinge, you can manually adjust the vertical positioning of your door. If your door is dragging against your floor or carpet, you can raise the door from the bottom door hinge, or lower the door if the door is too high and catching against the upper door frame. Open and close your Andersen French door to determine where the door is rubbing. If the door is rubbing against the floor then the door should be raised, and vice versa. Open the door and insert a 5/32-inch hex wrench into the bottom portion of the door hinge. Push the hex wrench upward to access the vertical adjustment screw. Turn the adjustment screw to the right to raise the door, or turn the screw to the left to lower the door. Remove the hex wrench from the bottom of the door hinge and open and close the door to make sure it is positioned properly. Greg Lindberg is a graduate of Purdue University with a Bachelor of Liberal Arts degree in creative writing. His professional writing experience includes three years of technical writing for an agriculture IT department and a major pharmaceutical company, as well as four years as staff writer for a music and film webzine.